Another school year is upon us which means another season of varsity sports is about to begin at Concordia. From football to soccer, all of the school’s varsity teams will be starting their seasons within the next few days, weeks or months. Curious about what our teams have in store this year? Well we’ve got you covered with this season preview. The Concordia Stingers played their first game of the season against the Université de Montréal Carabins on Aug. 25, losing 37-19. Last season, the Stingers squeaked into the playoffs with a record of 4-4, but were bounced from the postseason in their conference semi-final against the Laval Rouge et Or. This year will prove to be a challenge for the Stingers as the Bishop’s Gaiters — whom they beat twice last year — are no longer in the division. This season, the Stingers will have to face the Carabins and the Rouge et Or twice — two teams Concordia hasn’t picked up a win against since 2010. Look out for key players such as quarterback Trenton Miller and wide receiver Vince Alessandrini to be this year’s difference makers. The Concordia Stingers men’s soccer team finished last season with a record of 4-6-2 which put them in sixth place out of seven teams in their division. The team was led by goalkeeper Karl Gouabé and leading point scorer Sébastien Boucley. The Réseau du sport étudiant du Québec (RSEQ) division is led by powerhouses like Université du Québec à Montréal (UQAM) and Université du Québec à Trois-Rivières, making this upcoming season a tough test for the Stingers. Their first game of the season is on Aug. 31 at 6:30 p.m. at home against UQAM. 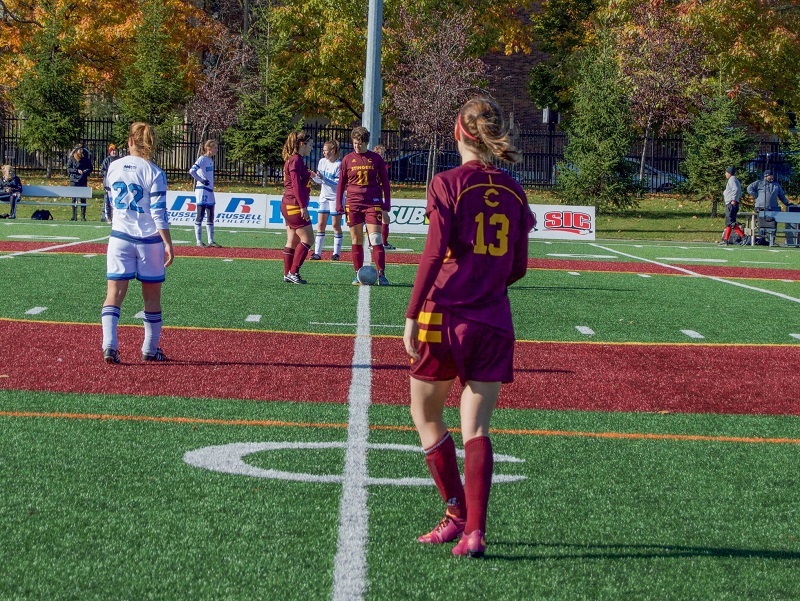 The women’s soccer team struggled last season, finishing the year with a 2-10-2 record that put them in sixth out of eight teams in the RSEQ division. Midfielder Laura Lamontagne led the team with five goals and three assists and will surely be a player to watch out for this season. Laval and the Université de Montréal will be the Stingers’ biggest challenges this season, as those teams took the top two spots in the division last year. Concordia starts their season at home on Aug. 31 against UQAM at 8:45 p.m. The Stingers men’s basketball team will look to build on last year’s success after finishing the season with a record of 10-6 — good enough for second place in the RSEQ division. The team was led by a fresh crop of rookies, as well as veteran guard Ken Beaulieu and fifth-year forward Michael Fosu. The Stingers will be without Fosu this year as last season was his graduating year. Look for Beaulieu as well as second-year forward Olivier Simon to take the reins this season. Their first game is on Nov. 9 against Bishop’s. Latifah Roach looks for an open teammate against the McGill Martlets. Archive photo by Ana Hernandez. The women’s basketball team is fresh off a season where they upset the Laval Rouge et Or in the RSEQ semi-final and made it to the provincial final. While the Stingers eventually lost to the McGill Martlets, the team’s ability to persevere and chip away at their opponents will surely carry into this season. However, veterans such as Marilyse Roy-Viau, Tamara Pinard-Devos and Richelle Grégoire are no longer with the team, having graduated last year. While the team is without their veterans, the Stingers are still ripe with talent and poised for a good season. Their first game will be against Bishop’s on Nov. 9. The Stingers men’s rugby team is fresh off a transition year that saw the team drop to a 1-6 record, putting them in last place in the RSEQ division. Head coach Craig Beemer had his work cut out for him in his first year as the team’s bench boss. With a team heavily composed of rookies, last season was a learning curve for the Stingers. However, with last season’s rookies earning a year’s worth of experience, the team is sure to be on the upswing this season. The team’s first shot at redemption will be during the season opener on Sept. 10 against their biggest rival, the McGill Redmen. The women’s rugby team is poised for another dominating season in the RSEQ with the return of veteran players Frédérique Rajotte and Alex Tessier who are fresh off a stint with the Canadian national team. Concordia went 5-2 last season which was good enough for third place in the division. The Stingers made it to the RSEQ final, but lost to their biggest rival, the Ottawa Gee-Gees. This year, the team’s biggest competition will be the pesky Gee-Gees and the Laval Rouge et Or. The team starts the season on Sept. 4 away against McGill. The Concordia Stingers are coming off one of their best seasons in team history after acquiring top rookies like Anthony De Luca and Philippe Sanche. However, the team will face a new challenge this year as long-time captain Olivier Hinse has graduated and is now playing in Denmark. The team will, nonetheless, be in good hands as veteran forward Philippe Hudon will be taking over the captaincy. Look for goaltender Philippe Cadorette as well as forwards De Luca, Sanche and Anthony Beauregard to make a big impact on offence. The team plays their first game on Oct. 13 on the road against the McGill Redmen. The Stingers women’s hockey teams celebrates a semi-final playoff series win last season against the UQAM Carabins. Archive photo by Alex Hutchins. Much like the men’s hockey team, the women just had a successful season, with the team making it to the bronze-medal game of the National championships. The team eventually lost in that game and took home fourth place. They also finished second in the RSEQ playoffs. Forward Audrey Belzile led the team with 18 points last season, and is sure to be a star goal-scorer alongside forward Claudia Dubois this year. With Katherine Purchase coming back as the starting goalie, the Stingers have the potential to build on last season’s impressive finish. They will play their first game of the season on Oct. 15 against the Ottawa Gee-Gees. With a strong crop of wrestlers, the Stingers are a force to be reckoned with this season. At Nationals last year, Vincent De Marinis took home a gold medal in the 65 kg weight class. De Marinis is going into his graduation year at Concordia and, in an interview with The Concordian last semester, said he is always striving to improve and win more tournaments. Last year, rookie Fred Choquette took home bronze at Nationals and, going into his second year, has the potential to climb the ranks of the heavyweight division. Going into the season, expect third-year wrestler Jade Dufour to make a big impact as well. She finished second at Nationals last season.